How popular is the MQM in Baltistan? Take a look at this photo of its rally in Skardu, published on the front page of the daily Express on November 6, 2009... Some kind soul has taken a magnifying glass to it, helpfully pointing out where the services of Photoshop might have come in handy. Now my question is this: With Sultan Lakhani about to bring out an English paper - called the Express Tribune - married to the International Herald Tribune, is this the sort of objective, unbiased journalism we can all look forward to? Skardu? Not surprising given the strange insecurity at the heart of the entire MQM enterprise. Regardless of its overwhelming hold over Karachi's populace,the MQM has never shied away from what can only be termed as the photoshopping of votes at polling booths. No matter that they would win anyway, the desire to win with the biggest margins of victory in the history of mankind obsesses the MQM. 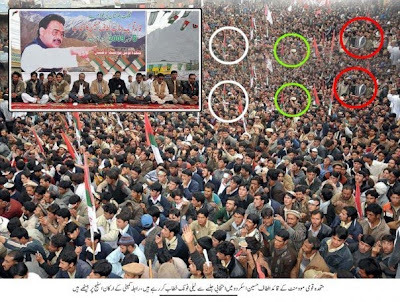 But the MQM is not alone in photoshopping crowds at jalsas. Legions of the great and the good have indulged in the same trickery. One blatant and recent example was Yousuf Raza Gilani, whose trip to Gilgit in late September was accompanied by at least one blatant crowd-multiplier photo printed in many papers, including The News' Islamabad edition. Is there something about Gilgit-Baltistan that encourages the photoshopper? Win in Karachi "anyway"? I sincerely doubt that without Ye Olde Boys on CD125s with TT pistols they'll do as well, in terms of number of seats. In Gilgit itself, however, they can genuinely do well because hey, that loveable har-dil-azeez Altaf Hussein will win anyone over. To me, the whole belt around the 2nd row of circles appears Photoshopped. The repetition of first row of circles in second row is so obvious. Acha to Ab yeh " Dekho Aur Jalo ". Your Jealousy,Hatred and Enmity is our Pride, which more connect us to Altaf Hussain and MQM.
" Insha ALLAH Good news is about to Come from Gilgit Baltistan". First all the news Items and images are fetched from APP Web services. Second a common knowledge that News paper worldwide are based on rows and columns of pre defined length. They have to fit every content on this length , if you watch main heading below that “8 TV challney ki manzordady” is as same length of the image. Now here how it works , the editors finalized what content to appear on particular page. The editors manually check the aligned and spacing of each page. Now editor wanted to fix that photo on front page, but he cannot shrinks or expand it. Can not shrink because it will become too small for people to understand when print out come. Expand it because pixel will be destroyed. He says space that can be utlize on stated heading , he will try to find out if any other images from same news items can fit the place. But if he can not he will edit the picture him self by either merging or any other technique. To the person above being such an avid supporter of MQM, you do realize that not all frontpage layout of the newspaper published each day is exactly the same, and software do provide you the facility to tweek the sizes of columns and image holders rather than the images themselves. Be that as it may, you would notice that I never directly accused the MQM of doing the photoshopping. Any reasonable person would assume the same, but for editors to go along with it (when it is blatantly obvious) is probably a bigger shame and indicates that they either caved in to pressure or went along to appease certain interests. Both are equally reprehensible as far as news ethics are concerned. I agree with khabardrama, however, that the MQM is not the only guilty party in this matter: as pointed out, other parties have been similarly compromised before. it does not matter , if you are journalist or not. This is whole IT matters, Express is urdu nastliq paper , they can't cut the heading that easily , if they try to shorten it , the meaning goes all wrong ! i know how express works , because www.express.com.pk was entirely developed by me. go and check with them Enabling Soft was the company name and kaiz was there developer. why this image was edited ?? if u give me proper justification from journalist point of view i will accept that ur right. and second u failed to acknolwdge that pictures are actually provided by APP most of time , news paper guy do not have the photographers at every place and they pay price for it..
have same layout please get ur eyes checked ! This is an interesting case. I went through the MQM website to find their pictures of the MQM rally in Skardu. Interestingly enough, none of the pictures - as far as I could tell - were photoshopped. While the MQM has it's faults for a variety of other reasons; in this particular instance, I think the responsiblity for the photoshopping rests with the Express News team. Also, I don't understand why they would do this? As far as I could tell from the MQM website pictures, the rally had a pretty good crowd. If any of you really want to check it out, the pictures are linked at the bottom of the front page of the MQM website. With due respect Mr Kaiz, you must be living on a different planet from most of us. I have no idea where you came up with the bizarre idea that APP provides all pictures to newspapers. Ok not all papers have their photographers on the spot I agree, but APP? I have seen Online, PPI, AFP, AP, Reuters pics scattered across most Pakistani papers and the odd PID issued Sarkari pic too. But APP supplying all, or even most, pics to newspapers??? That is simply not true. Please go back to website designing and stop trying to sell illogical nonsense disguised as science to us simply because you want to apologise for the MQM. It is indeed interesting to note that PkPOlitics is talking of no bias in journalism when all its own reports are so heavily biased and one sided. It is obvious PkPolitics are the spokesmen of Noon League I wouldn't go as far as saying a paid tout. Journalists are like umpires who must never take sides but you do and you question Sultan Lakhanis credentials? I think you are trying to joke. Keep trying. Shame on you on doing propaganda against MQM here it the original picture in response to your propaganda.....Newepaper is actually responsible for this photoshoped picture MQM doesn't need to photoshop the pictures and see with open eyes and judge yourself shame on you !!!!!!!!!!!!! Yes, PRAC I waited for the results. The MQM has one seat so far, which in the circumstances is pretty remarkable. Yes I am laughing. Must be hard not to be in Kharadar where you could employ the services of those heroic boys with CD125s and TTs. If only it was possible to lock the pollimg station until the results were miraculously different the next morning, all of Gilgit-Baltistan would be yours! Just want to know how many people slapped themselves today :D on MQM "historical" win in GB elections as it was obvious from the pic that is being discussed. I congratulate MQM on gaining the overwhelming majority in GB by winning a single seat out of 21 to date. Most of the anti-MQM's here are supporters of PTI or JI... Thats for sure! and some who do not support any party will say very arrogantly "Its my point of view, i dont have to support anyone" but will never be able to gain anything ALONE. MQM's one seat is endorsement of the VISION of MQM endorsed. We were NEVER looking for more than 2 seats, because we are only 3 months old in the region, and this one seat SO FAR itself is a major VICTORY for MQM. For the anters.... Has PTI or JI won ANY seats from there? Read the details of the terrorism of Harmai MQM in the above blog. MQM is described as manhoos keeray mukoray in the above blog which is right and i totally agree with it. Folks, irrepsective who being the source of image, do you like a sword bearing taliban with a cut-off head on one hand, or may be guys with TT under their pajamas. Fashionistas Get In The Last Word, And It's Oops!